We built a custom material management systems for a large environmental services company with over 50 locations across the US and Canada. Each location was equipped with RF hand held computers programmed by Accurate Data to collect inventory transactions and post them to a large and complex SQL Server database. Intermec 3400 barcode printers generate tracking label with unique numbers that are later scanned. Intermec 2425 and 700 portable readers were programmed to do a variety of transactions, from physical inventory to moves, drum pumping, consolidation, bulking, tank pumping, and pumping into vehicles. With the exception of the physical inventory, every transaction interacts with, and gets validation data from, the existing application logic contained in stored procedures in the SQL Server database. 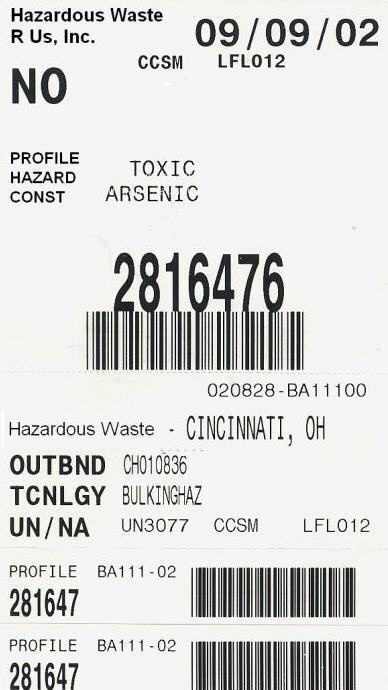 Because of the complexity of processing hazardous waste, over a hundred procedures are called by the hand held readers. Switchboard, our data collection server software, manages all of the uploading, downloading, and communications between the database and the Intermec readers. This system has been operating at over fifty locations in the US and Canada, all of them communicate with a single copy of Switchboard at corporate headquarters. This system was originally a DOS program written in C. This customer recognized the importance of the hand held transactions to their business and ported the program to VB.NET to run on the Intermec 700 reader themselves. One interesting feature is that some of this company's inventory is stored in trailers, which blocks the RF signal to the readers. We programmed the readers to go off line and store transactions and upload them when they go back into range of the RF network. When Accurate Data writes custom code for a client, we make all of source code available if our customer chooses to take over the system development themselves.